In discussions between Hua, her father and the generals, played as traditional jing roles (characters with painted faces), the story explores Hua's struggles to disclose her real self, as well as issues of filial piety, patriotism and collective versus individual desires. The Peking Opera traditionally minimizes its set as "one table, two chairs". In this part of the trilogy, director Li changes it to "one bathtub, two chairs", an approach that retains the lyric theater's tradition of imitation but incorporates a modern aesthetic. In the third and last segment, Liang Hongyu becomes a famous prostitute, even after establishing her fame as a warrior. She refuses to be honored by the Emperor and chooses to live in seclusion in her brothel. The head of the brothel uses 72 types of herbs to prepare her a bath, so as to preserve Liang's beauty and youth - but she is still plagued by loneliness and boredom. Three dead spirits come to visit Liang one night, hoping to cheer her up. A comic atmosphere permeates this drama, in which the actors appear in chou roles, the clowns in Peking Opera. 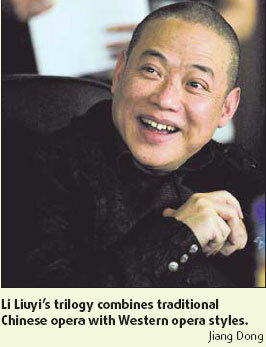 "The three women are actually one woman," says director Li. "And the three parts in fact tell of one woman's life before, in and after war. The complete trilogy offers audiences the essence of a desolate, lonely woman who finds herself under attack both from outside and within. "I have been long interested in Chinese traditional opera, which is one of the three major drama forms in the world. Greek tragedy and comedy have evolved into a mainstream theater style, while the Indian Sanskrit drama has died out in history. I try to revive the Chinese opera, borrowing modern elements of the Western opera." Li's three plays combine traditional opera movements and aesthetics with daring, symbolic stage props to reflect the psychological dimensions of the legendary female warriors. Composer Guo Wenjing, whose music gives the trilogy an extraordinary atmosphere, adds: "I have experimented to make the score sound typically Chinese but with a Western-style orchestration. "Though I use traditional Chinese instruments, the whole sense is contemporary."